Phase two of my “improving my skills” with my latest challenge: a doll and her bear. Last year I went through a creativity crisis that put me into a funk for a while. It is during this phase that I started sulking in front of the TV and became addicted to a reality show from Japan called Terrace House. If you are not happy about your own life, lose yourself by watching over people live! Ironically, this reality show was my inspiration to get back to what I love to do and break the wall that kept me from improving. Terrace house is a dating show but it also involves people who use that bridge to find out what they want out of life or achieve their goals. They were my inspiration to turn off my TV and work harder. Lauren Tsai in particular, a talented artist who spent most of her time drawing and focusing on her passion, is the one that motivated me the most. This doll is the product of that inspiration, I am in love with making toys again. Now let’s talk about the doll. I used mercerized yarn to make this doll. Mercerized yarn is mostly used to make dollies but it is also great to crochet small amigurumi toys. I really liked working with that type of yarn and I think I will use it a lot more in future projects. I embroidered the eyes but this time I used a different technique that made the task much easier than my previous attempts. 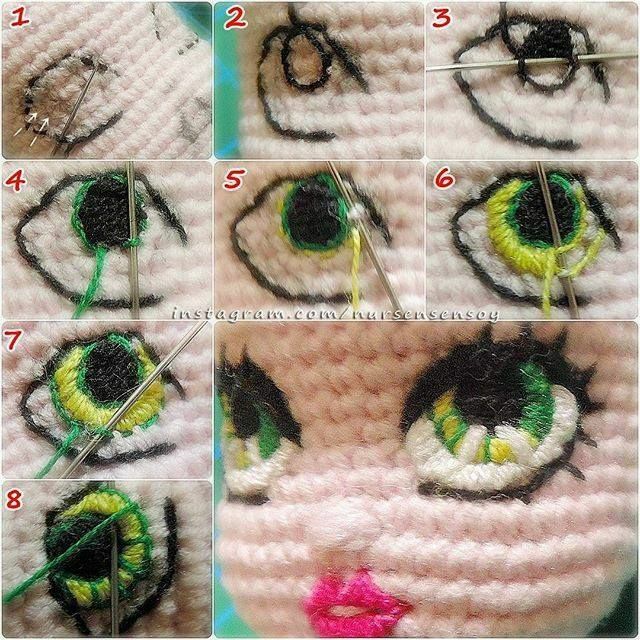 Still, I found it very hard to embroider eyes on a small head, there isn’t a lot of room to do your stitches and you are not careful you can end up with eyes too big for the face. The bear and the hat was a last minute decision. I had intended to just make the doll with her bag but since I am in challenge mode I thought I might as well try to add more. I am glad I did because it turned out really cute. So if you ever get into a creative hole and need to find a way out, I recommend Terrace House. It’s a great distraction to stop thinking about yourself while vegetating in front of the TV. You might find the inspiration to get back to what you love to do like I did!